Prepare stuffing ahead of time and cool before assembling birds. Place turkey skin side down. Season well with seasoning, salt and pepper. Spread first stuffing (i.e., cornbread) over the turkey, about 1/2 inch thick. Place the duck on top of the first stuffing and spread the second stuffing (i.e.Cajun) over it, about 1/2 inch thick. Place the chicken over the second stuffing and spread the third stuffing (i.e., shrimp) over it, about 1/2 inch thick. Fold the sides of the turkey together to close the bird, encasing the others. Have someone help hold it together while you sew the opening closed with stitches about 1 inch apart. Then tie the legs together. Place the turducken in a large roasting pan and cook in a preheated 325° F oven for 4-1/2 to 5-1/2 hours, checking doneness with a meat thermometer (which should reach 180° F at the thickest part of the turducken). 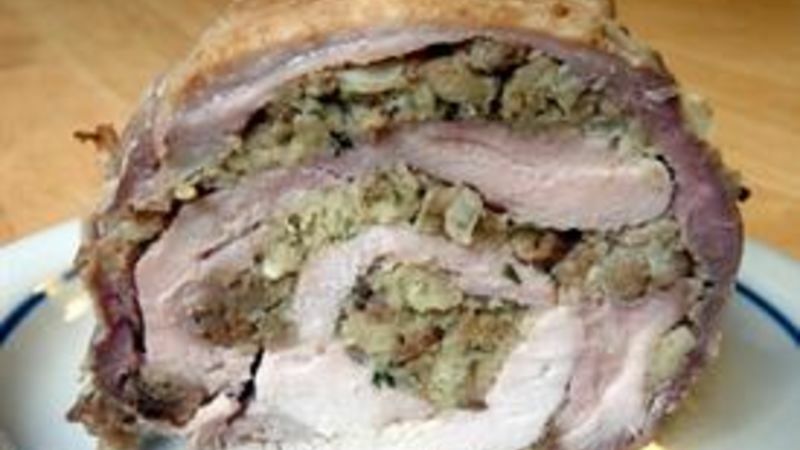 Allow turducken to rest out of the oven for 20 minutes before carving and enjoying. To save a lot of effort and time, have your butcher debone the birds for you.